St Mary’s is a growing, welcoming church serving the community of Knutton in God’s love. Our aim is to provide reverent and inspiring worship, to be all inclusive and provide a sacred space that is truly open to all. We strive to be a church that demonstrates true compassion within the love of God, showing by example and thereby motivating the whole congregation within the wider community. Find out more about us. This year has seen the 100th anniversary of the end of the ‘war to end all wars’. Sadly that was not the case, but at 11am on the 11th November 1918 the guns did fall silent. Last weekend, on Remembrance Sunday, we commemorated this at St. Mary’s. This year it seemed to have an ever deeper relevance. The service in church and the following act of remembrance at the Knutton war memorial were very well attended. Jesus came to bring peace, let us ask for his “Shalom” (the Hebrew word for peace) that one day the guns will fall silent forever. There are photos of what went on here on the website. To conclude just 2 well known phrases heard at remembrance. We are a fairly traditional Village Church but always open to new ways of reaching out through worship to our local communities and congregation. St Mary's mission is to make Jesus real in today’s life and part of this is to welcome our friends from the Indian Orthodox Church to worship with us. Our church, part of the Church of England, has a dedicated volunteer leadership team headed by the vicar. 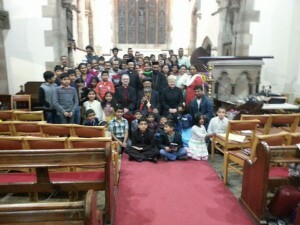 As well as giving support and guidance, St Mary's provides a sanctuary at the heart of Knutton. "We want to discern what God is doing in His world and join in…serving our neighbours, community and wider world." St Mary's is easily accessible with nearby carparks. The Church is in the centre of the Village of Knutton. Parking is available either on street or on the Community Centre Car Park across from the Church itself. Join us for a service Of Holy Communion. with a mix of prayers , readings and hymns both traditional and modern.